Change your attitude: See yourself as a creative problem-solver and look upon every problem as a challenge and an opportunity to develop your creative powers. 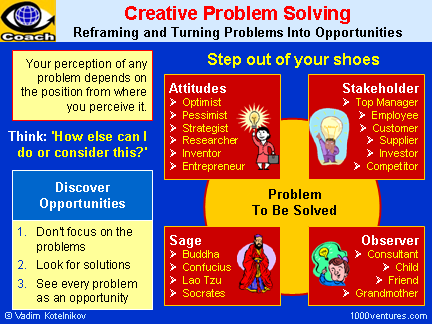 Make creative problem solving a habit: Look for challenging problems to solve. The more you seek for innovative solutions and ideas, the smarter and more creative you become. Now your subconscious mind will work on improving the situation. At a toothpaste manufacturer's brainstorming session, the target was to find ways to increase the sales volume by 10%. A surprisingly simple solution came from the production manager: just increase the diameter of the tube-mouth. Customers will not notice the difference, but a squeeze of the tube will produce more toothpaste. Increasing the diameter 4,8% will increase the area by 10%. PS: I use this case study as an illustration of outside-the-box thinking and creative problem solving only. I don't say you should use such methods to increase your sales volumes. Instead, I say you should follow the advise of Henry Ford: "The man who will use his skill and constructive imagination to see how much he can give for a dollar, instead of how little he can give for a dollar, is bound to succeed." One of the key functions of the corporate leader is problem solving which takes up a lot of executive time. An effective executive can solve problems and make decisions with a high level of competence. Your ability to deal with problems creatively and effectively is the key determinant of your success as a manager and a corporate leader. Sun Tzu's "The Art of War"
200 powerful Ten3 slides ► Click here!